IN RELATION TO ROOF CLEANING IN FLORIDA. The Occupational Health and Safety Administration (OSHA) who once recommended using Chlorine (Sodium Hypochlorite) to treat mold was the first federal agency to stop recommending the use of Chlorine in mold remediation. Subsequently, The Environmental Protection Agency wrote-out/edited their guide (EPA 402-k-02-003) to exclude the use of Chlorine bleach as a mold clean-up agent. 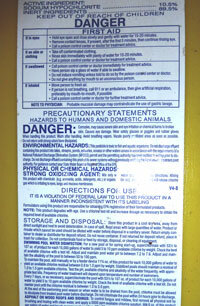 Most homeowners in Florida are used to seeing Chlorine in yellow Jugs, the warning label on the back of the jugs reads as follows. 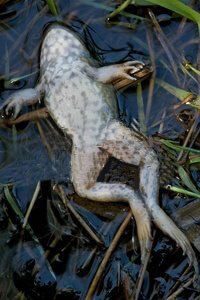 this pesticide is toxic to fish and other aquatic organisms. discharge effluent containing this product into streams lakes ponds estuaries oceans or other waters unless in accordance with the requirements of the National Pollution Discharge Elimination System (NPDES) permit and the permitting authority has been notified in writing prior to the discharge." View the U.S Governments toxicology reports for Sodium Hypochlorite (Chlorine) and Sodium Hydroxide. There are several important Civil, Environmental and Health reasons why chemical roof cleaning with Chlorine should be controlled. The absence of a state occupational license means that there are no restrictions on who can buy chlorine or what they can use it for. As a result chlorine is now the principal ingredient being used by the majority of roof cleaning contractors in the U.S.
(Chlorine) and Sodium Hydroxide (caustic Soda). Chlorine has the capability to give off highly toxic chloramine gas, Chlorine gas was used as a chemical warfare agent in the 1st World War. It is important to understand that commercial Chlorine is high strength, undiluted it is extremely caustic and will burn on contact. The dilution ratio of chlorine is generally measured in ppm (parts per million) a more easily understood measure is a chlorine/water ratio. A swimming pool holding 15000 gallons would require appx 10 gallons of chlorine which is equivalent to a 1.5% chlorine/water ratio. Roof cleaning contractors are using a far more dangerous ratio of up to 90% chlorine/water, there are environmental consequences of using chlorine at these ratios which are explained below. "Splash & Dash" Roof cleaning contractors do not rinse the chemicals off the roof before they leave, the concentrated residues that drip from the roof after dew or light rain will kill plants (see picture below). 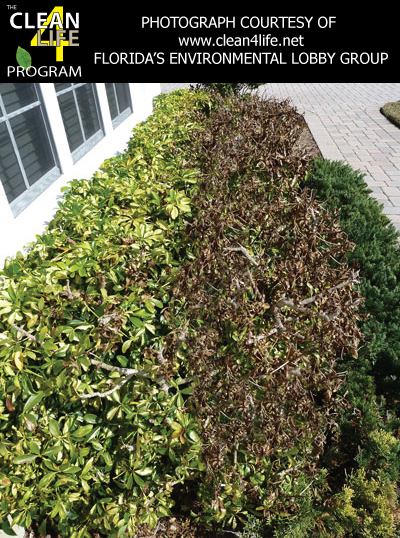 The client maintained that his mature and well manicured plants were covered during the cleaning process, the damage to the plants happened as a result of the residue of concentrated chemicals that dripped off the roof several days after the contractor had finished cleaning the roof. CAUTION: DO NOT MIX CHLORINE BLEACH WITH OTHER HOUSEHOLD CLEANING AGENTS. DOING SO CAN CAUSE SERIOUS HARM TO HUMAN HEALTH AND EVEN DEATH. Mixing chlorine bleach with cleaning products that contain ammonia such as window cleaning agents or acids (such as vinegar sodium Hydroxide/hydrochloric acid toilet cleaners) will release chlorine or chloramines, gases which are highly TOXIC. Chris Tucker of Apple Roof Cleaning is not ashamed of being called a "Chlorine Cowboy" His chemical roof cleaning forum the RCIA advocates the use of chlorine for roof cleaning and he maintains that roof cleaning with Chlorine is perfectly safe. We have spoken to many customers who totally disagree, having had their plants destroyed by this type of chemical cleaning process, they are convinced that they will no longer have chlorine used on their roof. Why Does Chlorine Kill Plants? Chlorine damages organic cells by releasing free oxygen which combines with plant cell proteins causing them to denature. Because the hypochlorite ion forms when such compounds as sodium hypochlorite (NaoCl; bleach) contact the organic materials which make up the cell membrane, it is also likely that the lipoprotein structure is disrupted, causing cytoplasm leakage and killing the cell *. Soft Wash (Chemical Roof Cleaning) contractors are recognizing that customers are becoming increasingly Anti-Chlorine due in large part to the negative experiences many have had at the hands of cowboy contractors. We are now seeing "Soft Wash" contractors marketing Chlorine as a 100% Biodegradeable cleaning agent. The term Biodegradeable is totally misleading and certainly does not mean that Chlorine is safe, virtually every chemical compound is biodegradeable, highly radioactive isotopes are also biodegradeable (after 100,000 years). Our guidelines to consumers are as follows, if the contractor says he is using a "Soft Wash" 100% biodegradeable cleaner then it is probably Sodium Hypochlorite which is Chlorine. Chlorine is highly corrosive and at the concentration required for effective roof cleaning it has the potential to damage plants and metal fittings including gutters, vents and AC units. 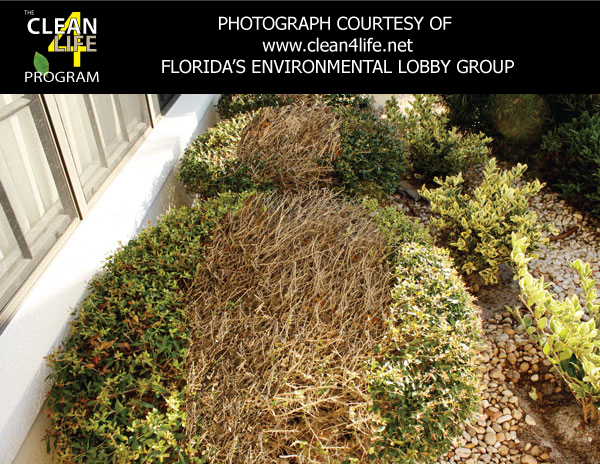 If the contractor says they will protect plants during the course of the "Soft Wash" chemical cleaning process then look at the photograph above, these well manicured plants were protected during cleaning, the residue that comes off the roof cannot be contained by tarps it will simply run off into the ground. 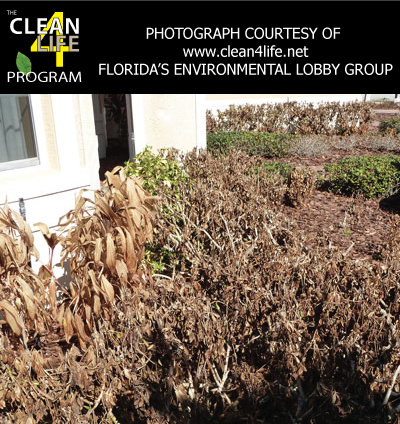 Join our online petition to license and regulate the chemical roof cleaning industry in Florida, visit the clean4life website and find out more about the unlicensed and unregulated chemical cleaning industry. * Karl J, Roberts Ph.D. Associate professor of Biology at Prince George's Community College.